Beautiful 925 sterling silver butterfly necklace handmade with an astonishing millefiori polymer clay design. The butterfly pendant effortlessly flutters from a 925 sterling silver chain revealing the ravishing finishes made from polymer clay. The polymer clay butterfly jewelry is overlaid with 925 sterling silver, revealing the butterfly's form, illustrated in intricate detail. The butterfly, a traditional talisman for a good luck will charm any bearer. Handcrafted using the highest quality materials, this exquisite piece is coated with enamel ensuring it will remain as glorious as the moment you set your eyes upon it. 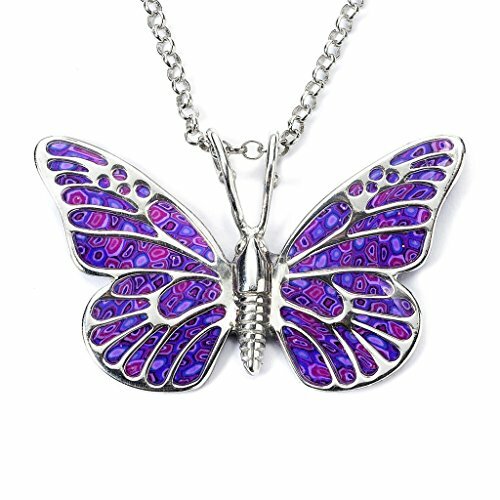 The butterfly pendant measures 1.8x1.2 inches, 4.5x3cm, while daintily suspending from a 16.5 inches, 42cm chain. Available in a beautiful array of polymer clay finishes: millefiori (multi-colored flowers), turquoise-color, red, purple or blue. Transform yours or her look with beautiful and colorful jewelry. A thoughtful and symbolic gift for any nature lover, sure to leave a timeless and lasting impression on any special woman, whether it be you wife, girlfriend, daughter or mother. The perfect surprise birthday gift idea for her, so treat your wife, whether it be your first year wedding anniversary, fifth, tenth or 50th. Charm your mom on Mother's Day, thrill your girlfriend on Valentines Day or see the look on your daughters face on Christmas. She'll love it. Millefiori, Italian for '1000 Flowers', is the creative technique used to handcraft the unique animal, insect and symbolic fine jewelry collection. Inspired by everyday romantic nature, each design is enduring, elegant, colourful and timeless.